It’s officially the holiday season. Let there be cake! 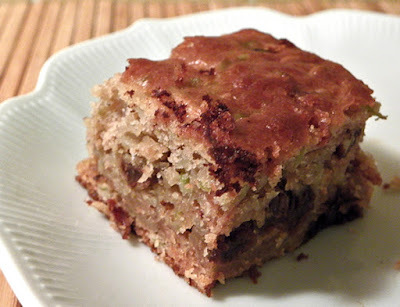 I’ve tried many cakes in the quest to recreate my Gram’s Apple Cake, with a notable divergence into Amen Farms Apple Cake, a delicious go-to recipe. 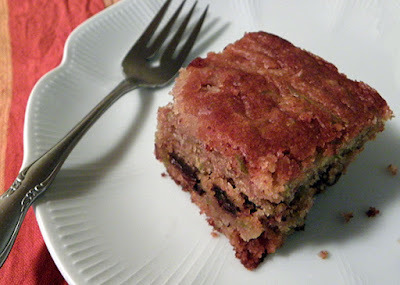 Old school apple cake differs from my past posts in that it contains raisins and nuts. I call it a 70’s recipe because it’s from Sunset Light & Healthy cookbook—and what’s considered healthy these days is different from when the book was published. 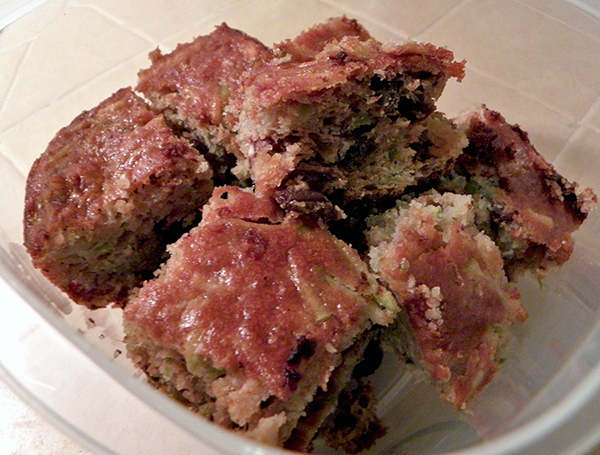 This recipe is low fat and free of saturated fats. It is not low carb, low sugar, gluten free, dairy free or egg free. It tastes perfect without frosting, though you could sprinkle it with powdered sugar and cinnamon, or decorate it with edible poinsettias, roses, or glitter stars for holiday festivities. A unique and fun feature of this cake’s preparation is combining the grated apples with the sugar and setting them aside for 15 minutes. This draws an amazing amount of liquid from the apples. The liquid keeps the cake moist for days and makes the apples a bit crunchy rather than soggy. Plus it adds sweet contrast to the tart apples. There was no salt in the original recipe, so I added ½ teaspoon to temper the sweetness. I also changed the oil to walnut, my favorite for baking. You can substitute any kind of bland oil that you have on hand. You can serve this casually at home, right out of the baking dish. Or for a more formal occasion, cut squares and serve them on a fancy plate. Enjoy your holiday season! Consider bringing this hearty no-frosting cake to holiday potlucks, or whipping it up for visits from the relatives. Or, better yet, share some cheer with your hard-working, cake-loving coworkers. Preheat oven to 350 degrees F. Lightly coat a 9” x 13” baking pan with oil or cooking spray. Set aside. 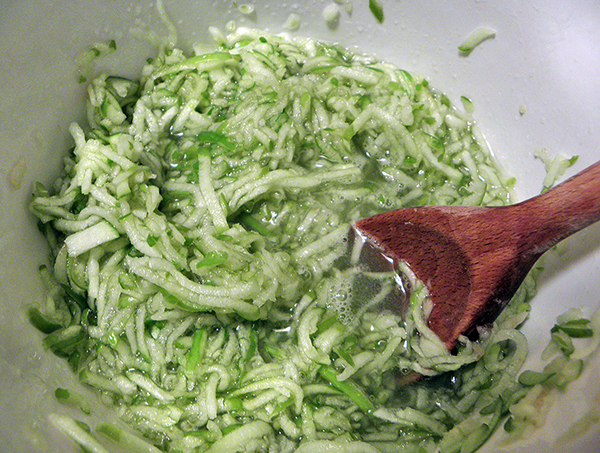 Coarsely grate the apples; it’s fastest and easiest to use a food processor. Place apples in a large mixing bowl and mix with sugar. Set aside for 15 minutes to sweeten apples and draw liquid from them. In a medium mixing bowl, beat eggs till smooth and frothy. Beat in walnut oil, buttermilk, and vanilla. Set aside. Sift together flour, baking powder, baking soda, cinnamon, and salt in another medium mixing bowl. 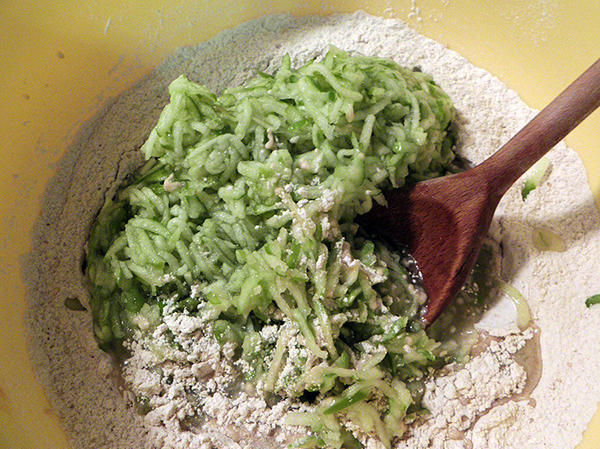 Add flour mixture to apples, mixing thoroughly so that all dry ingredients are moistened with as few strokes as possible. Add egg mixture to apple mixture, stir well. Pour batter into prepared baking pan. Bake in 350 degree F oven until knife inserted comes out clean, about 45 minutes. Cool on a rack. When cool, decorate if desired (see links above). Serve from the baking pan, or cut squares and serve on a platter. I made this for dinner with Zi and Helen, it smells divine. I loved your gluten-free variation, Betty! Thanks! I am making it this weekend for our Biology Club’s bake sale. 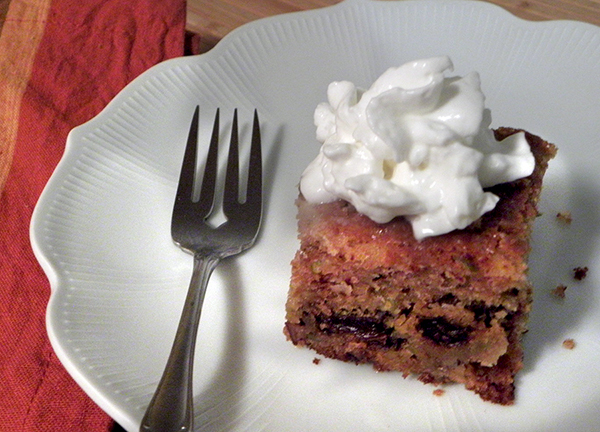 I have been substituting kefir for the buttermilk and it works very well.